North Minneapolis has seen its share of troubles—gangs, crime, violence, foreclosures. You wouldn’t know it inside the Capri, with its renovated lobby and auditorium. A capital campaign calls for $9–$12 million to renovate and expand the building; current economic conditions made it necessary to do what could be done now, for under $1 million, as quickly as possible. 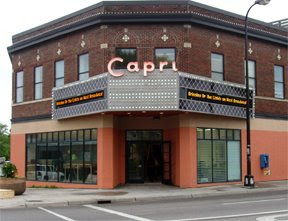 After a “Tribute to Jeanne Arland Peterson” concert on Sunday, April 19, the Capri closed and the contractors moved in. Two months later, the lights came on for a “Tribute to Lena Horne, Ella Fitzgerald, and Joe Williams.” The premiere on Saturday night sold out; the matinee on Sunday was nearly a full house. Charmin Michelle sang songs made famous by Lena Horne, Dennis Spears channeled Joe Williams, and Debbie Duncan brought us Ella Fitzgerald. Everyone looked fabulous, dressed to the nines. On stage were a giant vase of white calla lilies and a white chaise lounge. The band wore red boutonnieres. Classy. Michelle was her velvety self on “Stormy Weather” and “From This Moment On,” Spears brought Joe Williams home with “Every Day I Have the Blues” and “I Was Telling Her About You,” during which he displayed his acting skills. I won’t say Duncan stole the show because I enjoyed Charmin and Dennis very much, but she definitely ratcheted up the energy with Ella’s “Mr. Paganini.” Then she took us to Berlin for Ella’s 1960 performance of “Mack the Knife.” Ella won a Grammy for forgetting most of the words and famously improvising the lyrics (“And now Ella, Ella and her fellas/We’re making a wreck, what a wreck of Mack the Knife”). Duncan had to do a bit more improvising than she expected; her mic failed midway through the song. She moved to another without missing a beat. There were a few glitches with the sound and the lighting but nothing most people probably noticed much or cared about. Two encores, “Summertime” and “Squeeze Me,” both sung by all three, brought the show to a little over an hour. Perfect matinee length IMHO. We heard hints of events to come: the return of Sanford Moore, a live recording by Spears, a “Hot Jazz Summer Nights” program starring Michelle. At a reception in the lobby afterward, people were promising to buy season tickets. Photos from the Capri website. 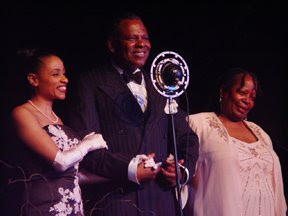 Photo of Charmin Michelle, Dennis Spears, and Debbie Duncan not from this performance.